Celilo Falls was known as Wyam by the Native peoples … meaning “echo of falling water.” Fishing took place with dipnets and spears and continued in the same manner at places upriver and downriver from it for at least 10,000 years. Historically, an estimated fifteen to twenty million salmon passed through the Celilo Falls (Wyam) every year. Because of the huge numbers of fish that passed through the falls, the surrounding area became an epicenter for trade. The people fished with dipnets for salmon and for other fish when the salmon were not running. 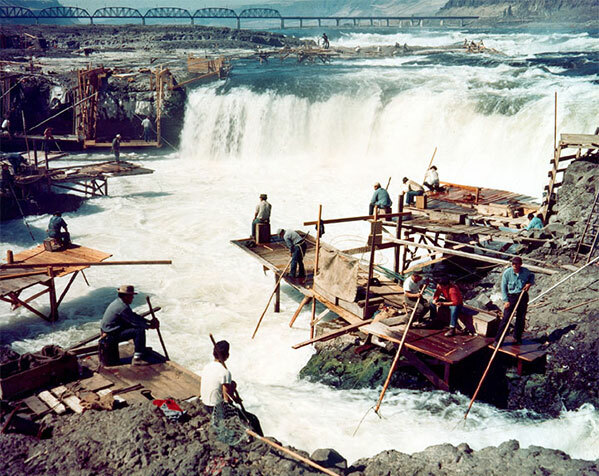 Fishermen fished from platforms that were everywhere at Celilo Falls (Wyam). The fishing platforms were built in locations where fisherman could most easily catch the salmon as they jumped up the falls on their way to spawn. Salmon were considered sacred, and every year after the first salmon was caught, thanks would be offered to the Creator before the first bite could be eaten. And so it was for thousands of years. Then, on March 10, 1957, as part of the nation’s effort to harness the river for electrical power, The Dalles Dam began operation. Hundreds of onlookers watched as the water behind the dam rose, silencing the falls, submerging fishing platforms, and flooding the village of Celilo, on the banks of the river just above Celilo Falls (Wyam). In less than six hours, the thundering river became nothing more than a quiet lake … and the way of life that had thrived there for so many thousands of years became forever altered.